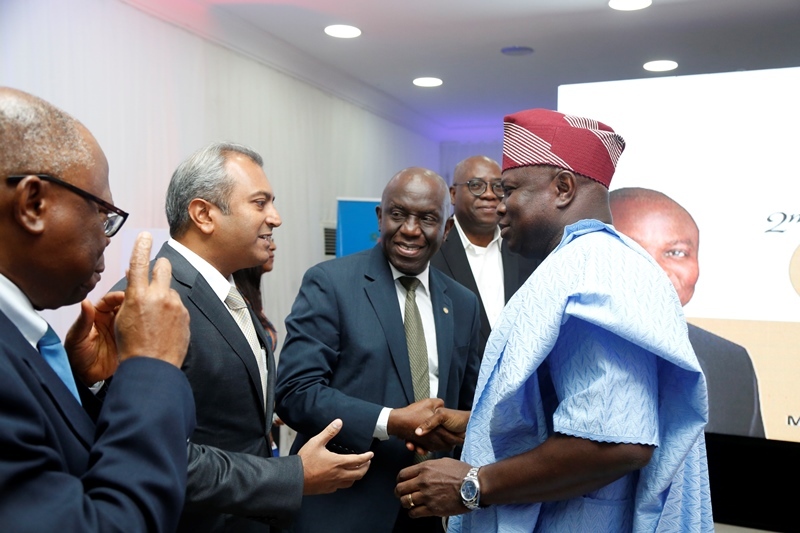 Lagos State Governor, Mr Akinwunmi Ambode on Thursday identified seamless port operations as a condition that will enable permanent resolution of the Apapa gridlock. 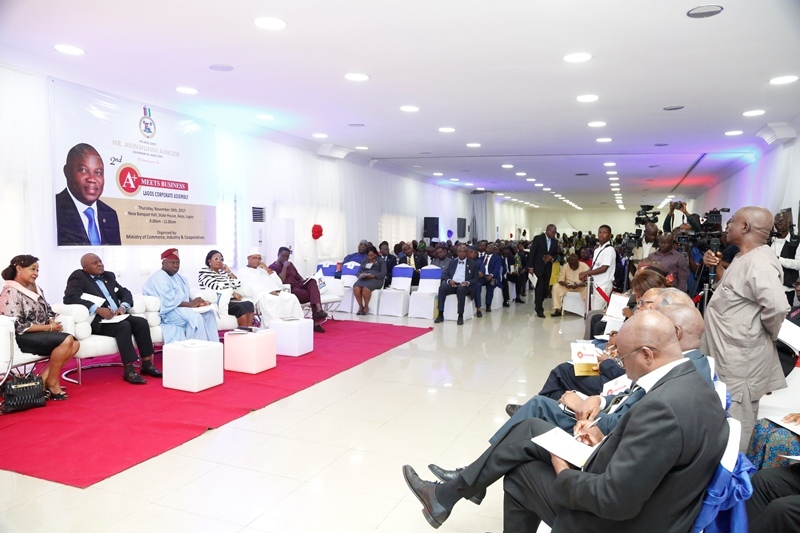 Speaking at the second edition of Lagos Corporate Assembly tagged ‘A+ Meets Business’, a forum organized by the State Government to interact with members of the Organised Private Sector (OPS) as well as Small and Medium Scale Enterprises, held at Lagos House in Ikeja, the Governor said while the move to repair the major roads in Apapa was laudable, concerted efforts must equally be put in place to address the issues that gave rise to the crisis which were more about port management. While responding to concerns raised by the business community on the negative effects the chaotic situation in Apapa was having on their business, the Governor said call-up system for tankers and containerized trucks must be structured to eliminate the present chaos, while issuance of licenses for more tank farms in the axis must be put on hold. He said: “Beyond the roads, the fundamental issues have more to do about the concession and also the fact that the basic capacities of the Ports not meeting what is presently going on there and then maybe in the loading bay inside the ports you only have capacity to accommodate maybe about 50 trucks and then there is no organised exit and entrance system. “So, someone who does not have any permit drives all the way from other states without any focus and then pack on the bridge; he does not even have any business inside the ports, the ports maybe can only take 50 trucks and then you have almost like 500 trucks so everything is just totally disorganized and because Lagos is a sub-national, there are limitations of political power play and the conflict of personalities and so those things affect your organizational drive. So, sometimes, Governors sometimes get frustrated and out of frustration you keep quiet. “The truth is that those issues are more germane than the roads. So, if Akin Ambode goes and repair the roads but the planning process and logistics to enter the ports are not in my hand and should I now go to the long bridge at the toll gate and stop those trucks, they will say I am being sectional and so I must allow free movement as a cosmopolitan state and so people come in and go out and we are just in a fix. “So, on other part of repairing the roads, the Federal Government has taken charge but one thing is to say what you want to do, the other thing is to quickly go and do it and so in the process of planning, speaking and delivery, it could take years but within our own limit as a State Government, we have set up a Joint Task Force of all the security agencies to ensure that at least there is still free movement within the structured chaos that we have in Apapa,” he said. While expressing optimism that the intervention of Vice President, Professor Yemi Osinbajo would go a long way in addressing the crisis, the Governor also condemned the recent granting of approval for another tank farm to be situated in Apapa, saying such would only aggravate the chaotic situation already on hand. On international trade fair complex, the Governor said while awaiting the process to issue out another concession by the Federal Government and development which may take years, the State Government, in the medium term, would look into the possibility of getting an investor to build a large convention/exhibition centre in the State. 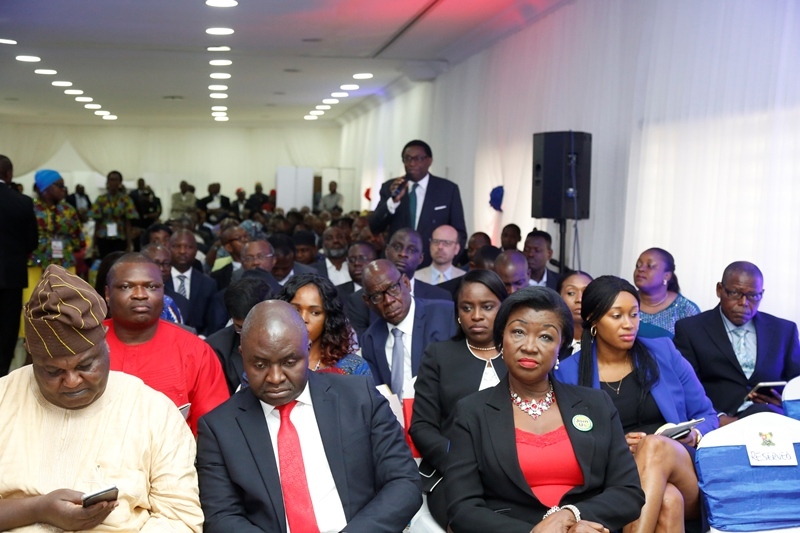 Speaking on the Oshodi Transport Interchange and Airport Road currently under construction, Governor Ambode said the projects were conceived and being implemented to create massive jobs for the people, and also transform the face of Lagos forever. He said in a bid to scale up infrastructure, a summit on Infrastructure Financing would hold early next year, while the State Government is also willing and ready to partner with any investor interested in investing in provision of critical infrastructures. On efforts made so far to enhance the ease of doing business, the Governor said an industrial park had been approved for location in Imota, while another industrial development centre was approved, aside the fact that over N10billion had been released to the Lagos State Employment Trust Fund (ETF) to grant loans to members of the informal sector. He said the State Government also approved business clinic for the Micro and Medium Scale Enterprises (MSMEs), while the Public Private Partnership Office had also been reactivated, in addition to harmonization of inspection of work places. 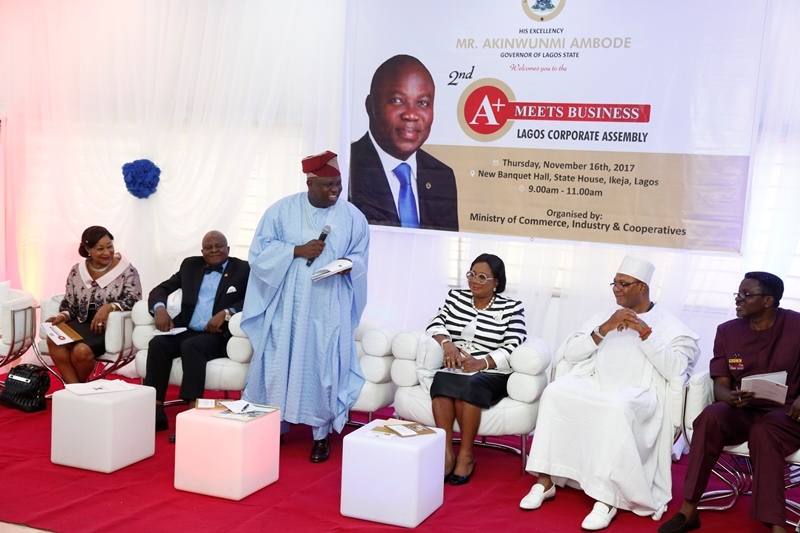 Earlier, President of Lagos Chamber of Commerce and Industry, Dr Nike Akande; Chairman, Ikeja Branch of Manufacturers Association of Nigeria (MAN), Otunba Francis Meshioye; and Chairman, Nigerian Association of Small and Medium Enterprises (NASME), Lagos State Chapter, Dr Solomon Aderoju commended Governor Ambode for the various laudable initiatives such as massive infrastructural renewal, rail infrastructure, investment in security, traffic management, power sector development, Light Up Lagos project, the N25billion ETF, among others, saying the projects were important enablers to the private sector. They also commended the Governor for addressing all the complaints raised by them at the last year edition of the meeting.